The volume considers black theater in the 20th century as a form of civil disobedience, with productions written and staged to challenge the status quo by featuring black characters, much as the Civil Rights Movement fostered change with blacks visibly and non-violently confronting segregation by placing themselves in opposition to its unjust laws. “What this showed me was that King understood the real-life experience in terms of drama, and that allowed me to understand drama in terms of real-life experience,” Rankine said. The book takes an interdisciplinary approach, blending Rankine’s training in Classics with consideration of contemporary theatre. He conducts his analysis through the dramatic form outlined in Aristotle’s “Poetics” in the fourth century B.C., which divided tragedy into six parts: character, story, thought, sight, music and diction. Rankine explores how playwrights such as Rita Dove, Eugene O’Neill, Suzan-Lori Parks and August Wilson put black bodies onstage in ways that challenge, re-appropriate or oppose the Aristotlean themes and the way that they were traditionally expressed in U.S. society. “This theater has worked within the context of a conservative framework in order to infuse American drama with the moral conscience of black experiences within the United States,” he said. That black playwrights were not the only ones concerned with such issues—O’Neill was the descendent of Irish immigrants—is significant to Rankine as a reflection of their universality. Rankine joined the Hope faculty in July. He was previously on the Classics faculty at Purdue University for 15 years, with affiliations in the African American Studies and Research Center, comparative literature, and philosophy and literature. He was assistant head of Purdue’s School of Languages and Cultures from 2007 to 2012, and was director of the university’s Interdisciplinary Program in Classics from 2004 to 2007. Rankine completed his doctorate in Classical literature at Yale University in 1998 with his dissertation on Seneca’s tragedies. He has since developed interdisciplinary interests in African American literature and the reception of the Classics among black American authors. His first book, “Ulysses in Black: Ralph Ellison, Classicism, and African American Literature,” published in 2006 with the University of Wisconsin Press, was named one of “Choice” magazine’s outstanding academic books in 2007 and is currently in its second printing. His publications also include numerous articles, book chapters and book reviews. In addition, he has made more than four dozen scholarly talks at professional conferences and in other settings. Rankine has received external awards and honors including an Andrew Mellon Graduate Fellowship, Woodrow Wilson Foundation Career Enhancement Fellowship, National Endowment for the Humanities (NEH) Summer Seminar Fellowship and an invitation to serve as an NEH Summer Institute faculty member. Recognition from Purdue University included the Excellence in Teaching Award and the Frederick L. Hovde Award for Outstanding Faculty Fellow, as well as grants and fellowships in support of his teaching and research. Rankine graduated from Brooklyn College in 1992, and he also holds Master of Arts and Master of Philosophy degrees from Yale in addition to his doctorate. Prior to joining the Purdue University faculty, he served as an instructor at New School for Social Research of New York University, at Bronx Community College and at Brooklyn College. 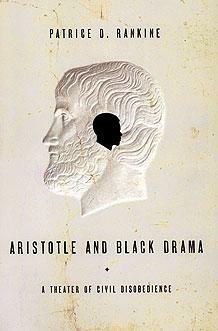 Copies of “Aristotle and Black Drama” are available for $59.95 at the college’s Hope-Geneva Bookstore, which is located on the ground level of the DeWitt Center, 141 E. 12th St., and can be called at 800-946-4673 or (616) 395-7833.